Shin Splints, also known as medial tibia stress syndrome, MTSS for short, this injury is an inflammation of the tendons and/or the muscles located around the tibia—your shinbone—resulting from small tears that occur in the muscles around the front portion of the lower leg. This injury is common among beginner runners and those scoring a comeback after an extended layoff. 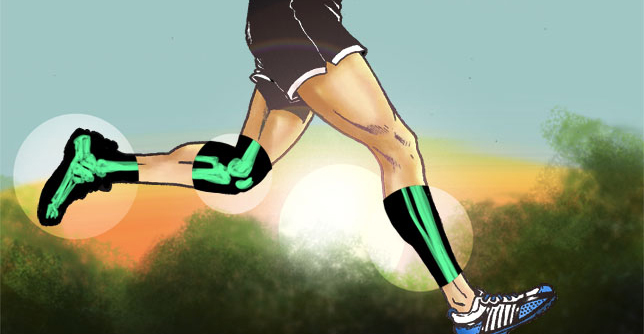 According to survey, shin splints make up about 15 percent of all running injuries. Symptoms: The main symptom of shin splints is an aching, stabbing sensation felt along the inside front of the lower leg, about halfway down the shin or all along the bone—especially during the first few miles of a run. Causes: If your feet tend to roll inward excessively, what’s known as overpronation, then you are more likely to develop the condition. Beginner runners and women who wear high heel often are also at a greater risk. Also, running on uneven or slanted surfaces might increase the risks of injury. This ailment also plagues runners wearing improper footwear and those with flat feet or high arches. Fix it: At the first sign of pain, reduce your volume and back off your running to an easy level for at least a couple of weeks before slowly ramping it up while opting for the 10 percent rule as long as you can do it pain-free. Next, ice the injured shine for 15 to 20 minutes per day and keep it elevated at night to ease swelling. You can also wear shock-absorbing insoles to help provide you with more support in the arch. You might also stretch your calf muscles, preferably with foam rolling moves, and tap the shin with Kensio Tex tape to soothe the pain and speed up recovery. During the “relative rest” day, you might choose to swim, bike, pool run or do yoga if you don’t want to lose fitness. Return to running once you can do it pain-free—even long after you stop applying the RICE method. If the problem persistent for longer than a month, then you might need to see a physician for a thorough examination of the entire shin bone. Prevent it: For starters, if you are a beginner runner, then you need to opt for the 10 percent rule, increasing your mileage by no more than 10 percent from one week to the next. Plus, make sure also to listen to your body and adjust accordingly. Next, strengthen your calves with toes raises, eccentric heel drops, and calf raises. For runners with flat feet, orthotics might help but talk to your doctor before you make any decisions.